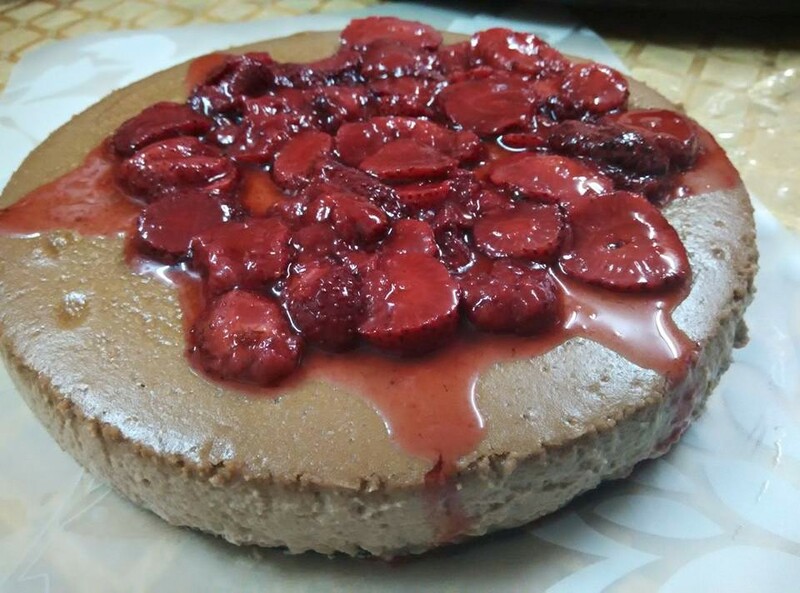 Coffee chocolate cheesecake dressed with a topping of stewed strawberries. This is my second attempt at baking a cheesecake on this trip home. The first attempt is also similar to this but it was a plain vanilla cheesecake. For this attempt, I used a pre-made chocolate cheese slab from Philadelphia, thereby skipping the process of melting chocolate for the cheese mixture. I had to clear the stuff in the fridge..... mum has an abundance of cheesecake to eat this week... "tiap, tiap, tiap" (cantonese for the sound of eating).. She told me she did not want any chocolate lava cake... >_< ha ha ha. For this cake, i baked the crust first at 125 celcius for 12 mins. I measured out 5 spoons of brown sugar (1 dessert spoon is about 10 grams), used about 300 grams of cream cheese,10ml of coffee essence, two eggs and about 300grams of thickened cream. I let it cool for a bit, then poured in the chocolate filling. Tapped it a few times to remove the air in the batter. Then wrapped the tin in foil and used the water bath method for cooking. I baked the cake at 180 celcius for ten mins, then lowered it to 150 celcius and baked for 50 min. Then let the heat in the oven to cook it for a further half an hour. I used up all the stewed strawberries and cream cheese I could find for this recipe. So now, I can move on to proper baking rather than dessert cakes and all that. Cooking it using water bath method. leave it to cook using residual heat and set in the oven. I should leave it longer, but I wanted to go to bed and don't want to manage the cake. The cake is still jiggly when it comes out. run a knife around it to separate it from the springform. It didn't crack but i have itchy fingers... LOL. So now it's in the freezer to set... there is no space in the fridge. Whatever. it can self defrost in KL temperature of 30 celcius. My mom says it spoils the texture of the cake, which is true... but it's not my problem if the refrigerator is full of crap that no one throws out.